Automated Ball Valve, Three-Way Plastic is ideal for mixing or diverting services in industrial, chemical, turf and irrigation, and pool and spa applications. Features a 3-seat design for efficient automation. Three-Way Detachable Electric Ball Valve is an electrical ball valve ideal for flow control in hot and cold water HVAC systems. Available with modulating or floating actuators. Electrically driven open and/or closed via a bidirectional AC motor. Two-Way Detachable Electric Ball Valve is an electrical ball valve ideal for flow control in hot and cold water HVAC systems. Offers a detachable actuator with position switches and indicator. 3-Piece Socket Weld Stainless Steel Ball Valve offers the best possible design for socket weld ball valves. Can be configured with either an electric or pneumatic actuator. 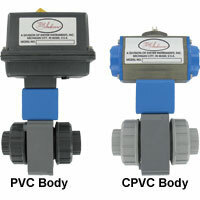 Applications include valve automation. 3-Piece NPT Stainless Steel V-Ball Valve is compact, lightweight and less expensive than other globe valves and segmented control valves. Offer bubble tight shut off without leakage and withstands high pressure drops. 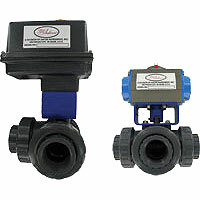 2-Piece Flanged Stainless Steel V-Ball Valve is compact, lightweight, and less expensive than comparable sized globe valves and segmented control valves. Applications in valve automation.